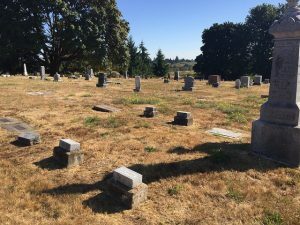 PHILOMATH, Ore. – A new self-guided, clue-driven walking tour near Philomath explores the history of a 157-year-old cemetery founded on land donated by a former slave. 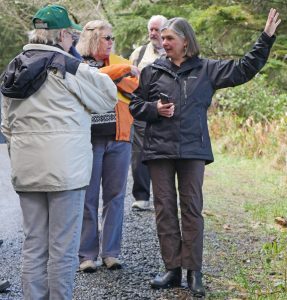 The walk, which is part of Oregon Sea Grant’s Quests program, takes place on the 6.7-acre Mt. Union Cemetery where about 2,500 people are buried on a gently sloping hillside. The cemetery was created on May 11, 1861 – one month after the American Civil War started. Reuben Shipley, who earned his freedom by driving his owner’s oxen from Missouri to Oregon in 1853, donated two acres of his farm to establish the cemetery on the condition that black people could be buried there. Shipley, his wife and six children were the only black family in Benton County at the time, according to the cemetery’s website. Cait Goodwin, an educator with Oregon Sea Grant and the coordinator of its Quests program, said those who complete the walk will become more familiar with the site’s history and the story of Shipley and others who are buried there. Goodwin also explained that Quests are self-guided learning adventures that use clues and hints to encourage participants to discover the natural, cultural and historical treasures of a place. At the end of each tour, participants find a hidden box containing a logbook to sign and a stamp to mark their accomplishment. 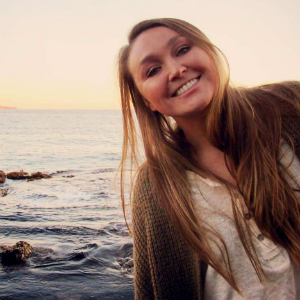 Quests are suitable, she said, for individuals, families and groups of all ages who wish to explore parks, trails and other outdoor spaces at their own pace. The Quest can be found at bit.ly/mtunioncemeteryquest. It was created by Ginny Weeber of Redmond and her granddaughter Kyah Weeber of Philomath, in partnership with Oregon Sea Grant and the Mt. Union Cemetery Association. It is the third cemetery Quest in the program, joining one in Lincoln City and another in Newport. Participants will traverse grassy and gravel surfaces and need about 30 minutes to complete the walk. The Mt. Union Cemetery Quest is slated to appear in the next edition of Oregon Sea Grant’s Oregon Coast Quests Book. To learn more about Quests and where to obtain the books, visit hmsc.oregonstate.edu/quests. The cemetery is at 2987 Mt. Union Ave. just outside the eastern city limit of Philomath. It is open during daylight hours. 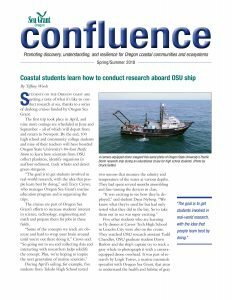 Oregon high school and community college students and teachers will join Oregon State University scientists on the research vessel Oceanus this month to gain at-sea research experience as part of a project to enhance STEM (science, technology, engineering and math) skills. The cruise, scheduled from Sept. 23 to 26, will depart from Newport, travel south along the Oregon coast to Stonewall and Heceta Banks, before veering northward to the Astoria Canyon, then into the Columbia River to Portland before returning to Newport. The research vessel will dock for two days in Portland, where there will be a series of activities, including tours for Portland area K-12 students. The students and teachers participating in the cruise are from high schools in Bandon, Lincoln City and Warrenton, as well as Southwestern Oregon Community College and Oregon Coast Community College. During the cruise, participants will conduct marine mammal and seabird surveys and correlate the presence and absence with oceanographic data. They will also conduct plankton tows where marine mammals are located to determine prey availability. Photo-identification of whales will be conducted to describe individual movement patterns, and the team will fly drones over whales to document behavior and assess body condition. 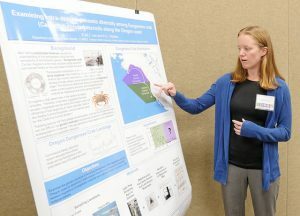 The project is a collaborative effort from Oregon Sea Grant, Oregon State’s College of Earth, Ocean and Atmospheric Sciences and the Oregon Coast STEM Hub, which serves educators, students and communities along the Oregon coast and is located at the Hatfield Marine Science Center in Newport. 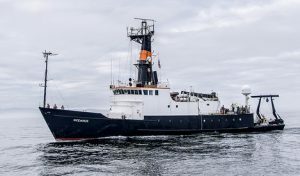 The research vessel Oceanus is operated by Oregon State University and owned by the National Science Foundation. 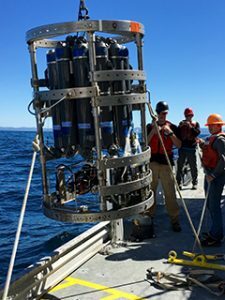 Leigh Torres, an assistant professor at Oregon State and a member of the university’s Marine Mammal Institute, and Kim Bernard, an assistant professor at Oregon State who leads the Zooplankton Ecology Lab, will be the chief scientists on the excursion. 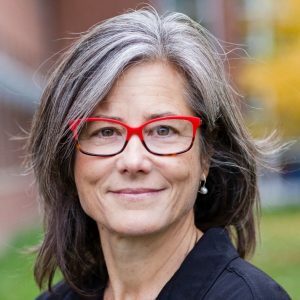 Lisa Blank, a professor of science education at the University of Montana, has been named as the new director of the Oregon Coast STEM Hub. 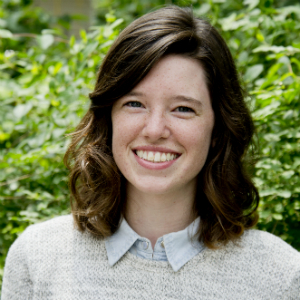 Blank, who will be based in Newport and start her job on Aug. 13, has a history of building partnerships between industries and organizations in the STEM fields and STEM educators in the academic pipeline from preschool to college. 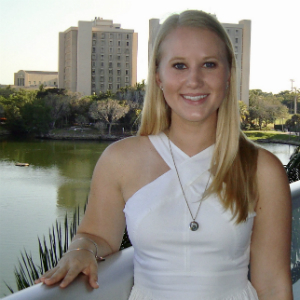 She began her career as an environmental scientist mitigating Superfund sites. She later taught middle- and high-school science and held academic positions at SUNY-Cortland and the University of Montana. 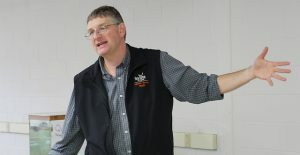 As director of the Oregon Coast STEM Hub, Blank will handle its administration, strategic leadership, resource development, management of grant funds, evaluation and high-level public exposure. She will also support the work of a multidisciplinary leadership council, lead STEM Hub staff and engage diverse stakeholders from public and private sectors to achieve regional and statewide goals. The Oregon Coast STEM Hub promotes integrated science, technology, engineering and math education and serves coastal teachers, students and communities. It is one of several regional STEM Hubs funded by the Oregon Department of Education. 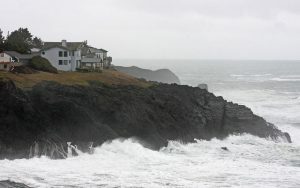 The hub is based at the Hatfield Marine Science Center in Newport and serves the entire Oregon coast. 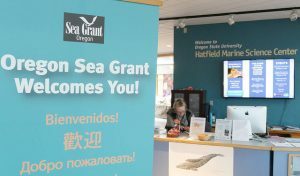 Oregon Sea Grant has been a foundational partner of the STEM Hub and recently assumed a role as the administrative home for the director. Have you ever wanted to buy seafood right from the boat, but weren’t sure what questions to ask or what to look for? Have you ever stood at a seafood market staring at all the choices but not been sure what was local or in season? If so, this summer is your chance to learn more about buying seafood. 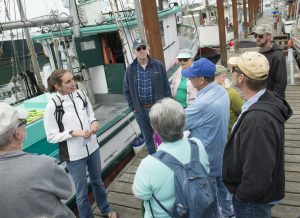 Experts with Oregon Sea Grant and the Oregon State University Extension Service will demystify the process during free, guided dockside tours in Newport and Warrenton that connect seafood lovers with commercial fishermen. 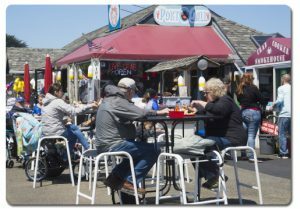 Oregon Sea Grant and Extension have been offering the tours – called Shop at the Dock – every summer in Newport since 2014 and in Warrenton since 2017. During the tours, participants learn what seafood is in season, how it’s caught, whether it’s sustainable, and how to identify and buy high-quality fish and shellfish. 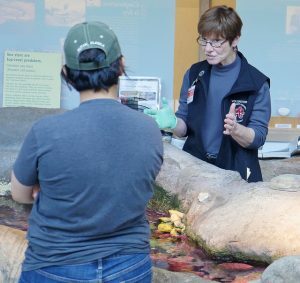 In 2016, the tours drew more than 350 people, said Kaety Jacobson, an Oregon Sea Grant marine fisheries specialist with Oregon State University’s Extension Service. Dates for the Newport tours are July 13, 20 and 27, and Aug. 3, 10 and 17, 2018, with groups departing from Port Dock 5 on Newport’s bayfront at 9:30 a.m., 10 a.m., 10:30 a.m. and 11 a.m. each day. The 90-minute tours are free and on a first-come, first-served basis. In Newport, registration is required only for groups of five or more by calling 541-574-6534 ext. 57427. In Warrenton, the tours will take place June 22 and 29, and July 13 and 20, 2018, at 9 a.m. and 11 a.m. each day, and will include a tour of a local market. Tours will start at the Warrenton Marina commercial docks located at the end of N.E. Heron Ave., at 200 N.E. Heron. For the Warrenton event, registration by phone is required for everyone and is on a first-come, first-served basis. To register, call 503-325-8573 at least three days prior to the event. 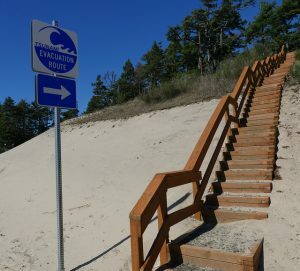 At both sites, participants are advised to wear comfortable walking shoes with traction, arrive 15 minutes early, and bring cash and a cooler with ice. For disability accommodations, please call the numbers above.